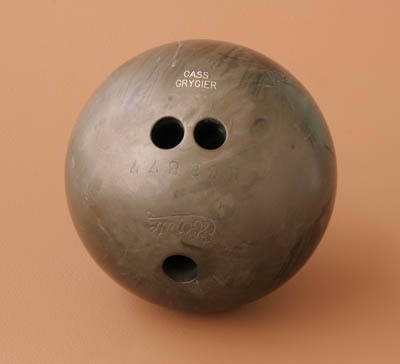 Grygier began his bowling career in an auspicious way by rolling three 300 games within the first two years. A quiet person, he was a member of the Detroit Stroh’s team that won the ABC tournament in Peoria, Ill. He and Phil Bauman won the international doubles title in Berlin, Germany, in 1936. He won the Petersen Classic in Chicago in 1942. Grygier, elected to the Detroit Bowling Hall of Fame in 1962, won nearly a hundred championships in city, state and midwest competitions. Cass Grygier began his love for the sport of bowling as a pinsetter at Joe Schemanske’s four-alley establishment on Detroit’s west side. He began bowling in 1926 and reeled off a perfect game during his initial season of competition. One year later, Grygier posted two additional 300 games and gradually advanced onto Detroit’s big-time bowling scene. Grygier was very quiet and did little talking on the lanes. “Grygier’s pin action speaks louder than his words,” was an oft-heard remark during the 1930s and 1940s. Grygier was a member of the Detroit Stroh’s team that brought Detroit its first American Bowling Congress tournament team title with a 3089 total at Peoria, Ill. His next highlight came during the Stroh’s team visit to Berlin, Germany, with Grygier and Phil Bauman winning the international doubles title in 1936. During the war years, Grygier took time out from his defense job one weekend and traveled to Chicago for a successful venture. He won the famed Petersen Classic championship with an 1807 total via games of 220-217-223-247-257-235-184 and 224 during the 1942 activity. Grygier gained nearly a hundred championship laurels in singles, doubles, team and all-events competition in the Detroit City Tournament; the Michigan State Tournament; the local, state and national Knights of Columbus and Elks tourneys; the Central States and various Midwest tournaments.